I'm so sorry I've not hung out with you in a while, it's not you, it's me. I've got another blog - I know, it's so terrible! But, I'm happy there, and you just make me feel bad because I can see the neglect in your eyes and so I stay away longer. I hope we can still be friends. I'm taking all my happy memories with me, and you can keep up to date with me over here. I hope in time you can forgive me. I thought I'd start a new regular feature on my blog - I've been reading Happy Zombies blog and I really like the 'daily cup of joy' posts - so I thought I could do something similar. Now, I'm not sure I have enough joy for a daily cup, but a weekly one I can definitely manage. So I thought I'd list a few things that made me smile last week. The coat hanger hanging from a bush in a field on my way to work. It's so out of place, it makes me smile everytime I see it. My first ever swap was a scavenger hunt (you get a list of words and have to find something that fits each one) and I really enjoyed it so I was really pleased to see another hunt swap. I received my package about a week before I'd even started thinking about mine (I'm a post partner assignment swapper as I like to really make it personalised, whereas some people have everything ready to send before partners are allocated). The seven categories this time round were: Red, Key, Flower, Fairytale, Animal, Something Sweet, and Profile Surprise. Above is my swap package - my partner included a small red notebook, a key necklace, a lovely pincushion covered in flowers, a card embellishment "WISH" as all fairytales start with one, some owl stickers (my favourite animal at the moment), some orange sweets (my favourite flavour!) and some measuring cups, which I somehow missed out of the picture, to help me cook the recipes in the edible New Orleans magazine she also included. Totally fab package to receive - I'm probably going to hoard the owl stickers instead of using them because I love them so much. Here's a close up of the superb pin cushion - really good handiwork. It took me a while to get my swap together - I had lots of ideas for some of the categories, but totally drew a blank for others. Here is what I sent my partner. Flower - I didn't take a picture of this, but I found some flower fairy colouring in sheets (difficult ones, not childrens ones) and as my partner likes flower fairies (and painting), I thought this would fit nicely. Fairytale - This was my experimental item - I found some fabric pens in town and decided to buy some hankies and add little fairytale pictures onto them. I'm not great at drawing so Ian helped out with this one a bit, it was good fun to do and I think they turned out pretty good. Animal - my swap partner had owls and penguins listed in her favourite animals on her profile, and these card embellishments just jumped out at me. Something sweet - I added in some skittles as I was worried any chocolate would melt. Profile surprise - I think I really caused myself problems with this one, because I made everything else fit with her profile so I was out of ideas. I settled on some postcards from Birmingham (where I was staying when I sent out the swap) and included my rail tickets that I used to get to Birmingham as she likes things from the UK, so I hoped they'd be something she'd never gotten before. I'm pretty pleased with how my swap turned out - hopefully she will be too! Before this swap I'd never heard of a cupcake topper. The swap included a link to some instructions and it looked simple so I thought I'd sign up. I was not expecting to enjoy making these so much - I could have made so many more (unfortunately I was going away for the weekend and didn't want to miss the deadline). I sent my partner a quick note to see if she had any parties coming up so that I could fit in with any themes she had in mind, and she mentioned that it was her son's first birthday next February. I didn't want to send her something she couldn't use for six months, so I set about making these cute elephant ones. They were very simple as the elephants were pre-cut and sticky, so I just added the stick and then used foam pens to make them all slightly different. I found on the internet that it's Elephant Appreciation Day on September 22nd so I suggested she threw a themed party to celebrate! I then set about making the ones for her sons birthday - I cut the circles out by hand as I didn't have a circle punch (something I definitely think I should invest in as it would give a much better finish). And because I didn't want to stop making them, I also made some purple butterfly ones. The swap called for flat ones, but my elephant toppers were made out of foam, so I was worried about sending them in an envelope. I found some polystyrene upstairs (from some flat pack furniture we recently bought) and had a brainwave! So my well packed toppers are now on their way to Canada and I can't wait to receive mine! On a lot of blogs that I read, people make more of an effort to decorate the house for the smaller holidays. I think this is quite normal in America and most of the blogs I read are written by people over there so I guess it makes sense. But I like it. 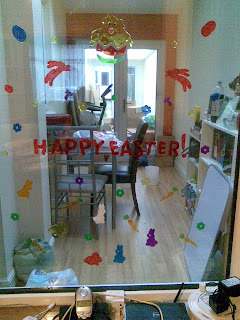 I don't want to just have Christmas decorations, I want to have Easter ones too, and so this year I did. It probably started last year with the giant eastery mug that I bought (matches our Christmas mug too), but that's all I had back then. I regretted filling it with chocolate eggs, 1) because it's pretty big so I had to buy lots, and 2) because I ate them all, by myself, in a big chocolate binge! So this year I bought some polystyrene eggs with a plan to paint them all prettily. Stupidly, I bought these at the end of Easter, so didn't finish it. Story of my life really! At the moment all the eggs are one solid colour, but I'm planning on adding detail before I use them next year. The decorations I did have this year were squidgy gel type things that stick to glass, so the random window between my dining room and library turned into my Easter display. The best thing about these is that they came from the pound shop, so it was nice and cheap. Please ignore the mess in the background (and the terrible quality - I took this on my phone). I also put my two lindt bunnies on my mantel along with the nesting owls I got for my birthday and my purple flowers Ian got me at christmas. You'll notice that I forgot to take the photo until after I'd eaten the right ones ears! Oops! Over the easter weekend I also found these cute chickens at a local craft show, so have added them to my easter decorations for this year. Let me win this one too! I'm not greedy or anything. I just think this is an awesome giveaway - look at all those stamps! I spent time this weekend searching my hobbycraft for some good stamps and they hardly had any, so I could really give all of these a good home. Fingers crossed for me! I think I should start thinking about hosting a giveaway too - but I'd have to finish something first!! I live in Eastleigh with my husband Ian. I love to bake and am finding blogging a good way to remember the things I've enjoyed and avoid making something bad twice! I also enjoy eating out and consider myself an amateur critic!